Did you miss an installment of the Luv Luv Festival? Click here to see them all! I've never met a stranger. Everywhere I go, I make friends. I like to refer to myself as the "Unofficial Mayor of Winston-Salem". I'm not sure if Mr. Joines would like my self-proclaimed moniker, but I really do know everyone. Sometimes it takes me a half-hour to walk 1 block (when I'm downtown) because people want to talk to me (and I can't help but stop and engage in conversation, too). Attending these Luv Luv dinners, I've met, seen, shook hands with, talked to, exchanged contact info with and schmoozed with a wonderful cast of Winston-Salem's characters professionals. I attended Wednesday & Thursday nights as a solo diner, but I asked two of my friends/co-workers from Taste Carolina to accompany me this time around and what a wonderful time we had! Day 4 (night #3 for me) of Dr. Brownstone's Sweet Summer Luv Luv Festival reigned in more luv, love, and welcomed in Chef Greg Picard of Orlando World Center in Orlando, Florida. He presented an elegant menu with familiar foodstuffs that everyone seemed to enjoy. It didn't hurt that the wine pairings were 14% ABV or above! 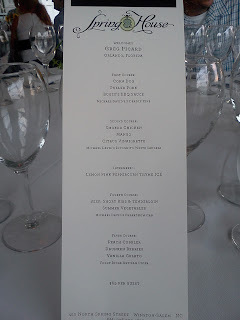 Thursday night's menu. Click to enlarge. Whimsical and creative, the pork-filled corn dog's showing was a little better than the tasting. The coating was not as sweet, corny or crispy as a hot, fresh corn dog, but anything on a stick is fun to eat. The pork was not vinegary or spicy, but it was a middle of the road pork that easily satisfied a melange of palates, I'm sure. I forgot to ask who Bugsy was. I'm sure Chef Greg told us, but it's hard to eat, tweet and hold court at a table full of fun people. Peek-a-boo! I see you, Chicken. I liked this course a lot. The chicken was hidden, (hence the 'incognito') snuggled inside perfectly sliced strips of fresh, sweet mango. My portion of chicken was miniscule and I had more fruit than meat and that was disappointing but what was presented on my plate was tasty. The smoke must have been light, because I didn't taste any. That was fine by me because I think I was more interested in the sangria than anything else. After enjoying two glasses of this, the night's edges got a little nebulous. Usually, intermezzos are very small, light, refreshing intermissions between heavy courses. The crisp fruit of the sangria eliminated the need for an intermezzo during this meal, but who in their right mind will turn down a shot of tequila? Not me. After letting the tequila float over my tongue and cool my throat, I held onto the small cubes of flavorful ice to let them melt and flavor my taste buds. 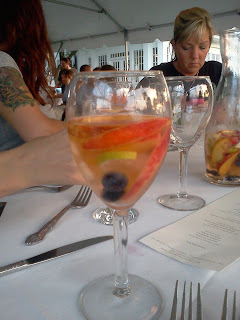 And then I ate more of the fruit from my sangria and waited for the main course. This course was so delicious, not only did I finish my plate, I finished my friend's plate as well. The beef was tender, succulent, flavorful and melted in my mouth. Not much chewing was needed. The potatoes--so creamy, the romanesco--so buttery. I hate beets, so I gave them to one of my dining companions. Served in a plastic sphere that had to be opened like a gumball machine bank, this dessert was the best of the week. An agglomerate of ingredients, it wasn't pretty or composed in any way, but cobblers were not made to take Glamour Shots for cookbooks (or blogs). 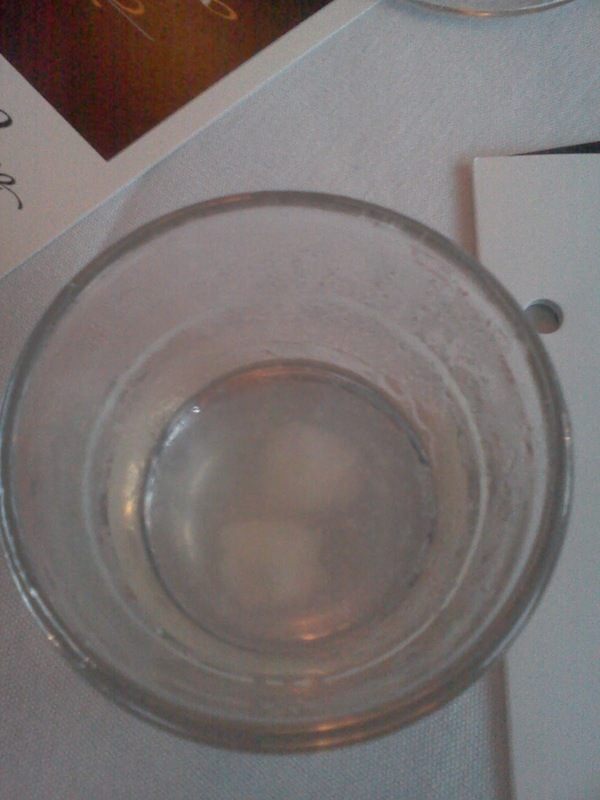 We were given shot glasses and poured shot after shot of the cider (I know I had at least 3; Shot glasses are tiny). Let me explain a little: Foggy Ridge Cider is hard cider (coming in at around 7% ABV), not apple juice or liquid apple product. It's still sweet and refreshing just like apple juice, but not appropriate for Little Johnny's snack time. 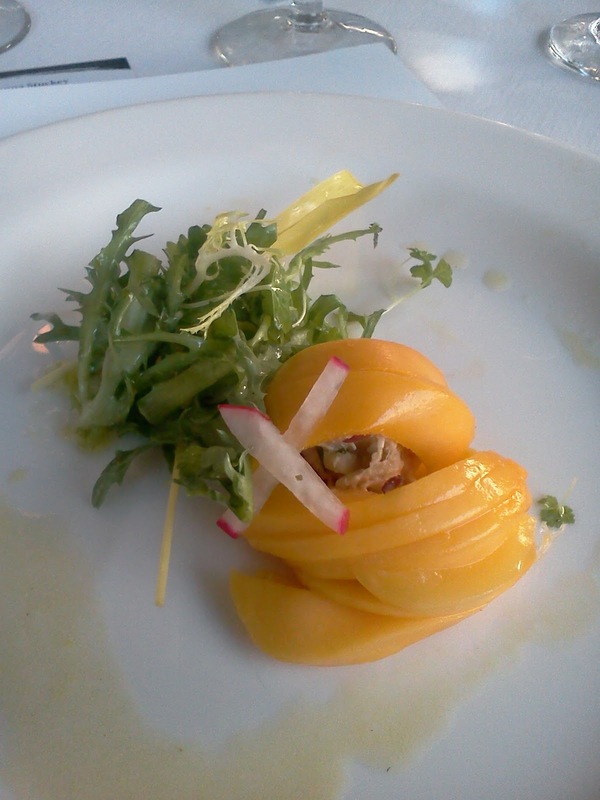 Chef Picard created an excellent late summer menu--Light, airy, refreshing and flavorful. Thank you for visiting our fair city, Chef. I hope you're able to return again and share your expertise and good humor with us! Sounds like you've really enjoyed Luv to Luv! FYI -- Foggy Ridge is located in Dugspur, Va. (located in Carroll County, Va., just north of Mount Airy). The owners retired to the area a few years ago from Greensboro. Just an interesting tidbit I wanted to share with you. Thank you for the information, Beth!